The idea for the book was inspired two years ago by the on-going feud between two of the most powerful commentators on cable news. "I kept hearing opinions about the on-air battle between Bill O'Reilly and Keith Olbermann, asking why they just don't lace up the gloves and get into the boxing ring," said author John Ruane, who watches both commentators regularly. "Well, I thought, great idea! So I wrote that story with Battling Will O'Malley facing off against Ken "Showdown Assassin" Oaferton with Rocky Balboa as the referee. It gets pretty wild and I have my own opinion about who wins. " Each story in this book was written to provide the reader with a fun experience including: * A Chicago businessman who realizes that his dream girl is the world's most popular daytime talk show host, Ola Humphrey. * The lengths network morning shows will go during sweeps weeks to win the battle for the ratings. * Host of Hard News, Chris Mattson, leaves the cable network and goes to Washington to shake things up in the Senate, representing his home state of Pennsylvania. * Late night talk show king, Daniel Littleton, loses his patience with a famous movie actress who bores him beyond his pain threshold. * Why cable's two greatest comedic minds remain relegated to a cable channel, while a lesser talent is given the most sought-after late night talk show seat in the world. John Ruane has authored three books, five stage productions, a short film, television pilot, and several newspaper and magazine articles. 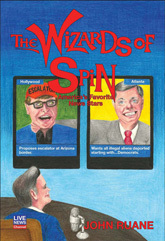 His current book, The Wizards of Spin, America’s Favorite News Stars (Second City Books), is a compilation of satirical fiction based on real news and the news and talk show celebrities who deliver their take on the world to America. There are stories based on Oprah Winfrey, Matt Lauer, Diane Sawyer, Chris Matthews, David Letterman, Stephen Colbert, Jon Stewart, Katie Couric, Dennis Miller, Conan O’Brien and many others. Ruane’s second book, Parish the Thought (Simon and Schuster 2008) received wonderful reviews from both critics and readers, leading to the hardcover edition selling out in just five months. In this memoir, the author shares the evolution of his faith, raised in a hard-working Irish-Catholic family of five children in a blue-collar neighborhood of Chicago. He shares stories of his entry into a Catholic grammar school, experiences as an altar boy, tales of good and bad teachers, as well as the priests and nuns who affected the lives of so many impressionable young Catholics. In 1999, ECW Press published Ruane’s first book, The Earl Campbell Story, profiling the life of NFL Hall of Fame running back and his battle with panic disorder. Ruane has also written five satirical stage productions, all produced in Chicago from 1985 to 1992. In 1988, he wrote and produced Comedy on Rye for the stage and followed with a five-minute film short, which won the Illinois FilmCam Award. In 1989, he wrote and produced a half-hour television show titled, Deckinger’s Place, which also won the Illinois FilmCam Award. From 1980 through 1989, he was a sports feature writer and reporter for the Chicago Sun-Times, working alongside heroes from his paperboy days, including Mike Royko, Ray Sons and Jerome Holtzman. His work has also appeared in several newspapers and magazines. For the past 17 years, he has owned and operated a marketing communications company and coached youth sports, coaching basketball, baseball and fast-pitch softball. He and wife Charlotte have been married for 28 years and lived in Roswell, Georgia for the past decade. They have four children and have recently moved back home to the Chicagoland area.